This Pizza Fondue will keep warm in your slow cooker as long as you need it to… but it won’t last long! Packed with meat and cheese, it’s pizza on a spoon! All the boys in our house love pizza. I mean seriously love pizza. And while ordering pizza out is great every once in a while, it can get expensive. (And don’t tell anyone I said this, but it can also get kind of boring.) So I’m always looking for ways to get creative with “pizza” recipes at home. This Grilled Pepperoni Bread is always a hit. After I used the grill to make a pizza recipe, I decided to see what other appliances I could use. Turns out, the slow cooker works just great! 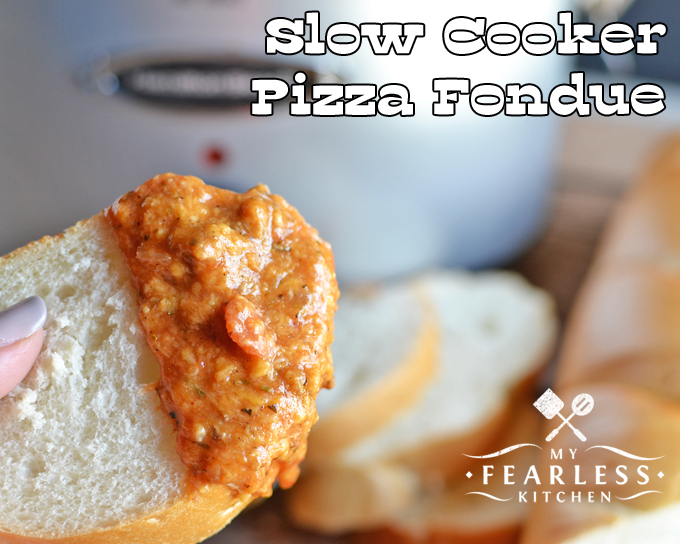 This recipe for Pizza Fondue is in “Slow-Cooker Fall Favorites” by Gooseberry Patch. I tweaked it a little bit to our tastes, but the bones of the recipe are the same. You’ll need to start on the stove in a large saucepan (this one is just the right size). Brown the ground beef (or pick another ground meat), mix up the sauce, and get the cheese all melty. I love using a Mix and Chop to get the ground beef all chopped up. It helps me get the meat crumbled as fine as I want it. (Add the cheese a little bit at a time so it melts instead of just making a big messy lump.) Then transfer the hot fondue to a large slow-cooker to keep it warm. Turn the slow-cooker on the warm or low setting, and you’re ready for a pizza party! Let me tell you… It tastes amazing! And with a pound of cheese in there, it should! Serve this hot (well, let it cool a moment so you don’t burn yourself with the lava-cheese) on thick slices of French bread, with garlic breadsticks, on store-bought pizza shells, or even on thick slices of homemade bread! It’s a great alternative to another boring pepperoni pizza! Have you ever gotten confused at the grocery store when you’re trying to pick out ground beef for tonight’s dinner? We can help! This Ground Beef Buyer’s Guide has everything you need to know about buying ground beef, plus you can download a free printable cheat sheet to keep handy in your kitchen or your purse! Every kitchen needs a few basic tools… These are ones that I use all the time when I’m cooking with ground beef! 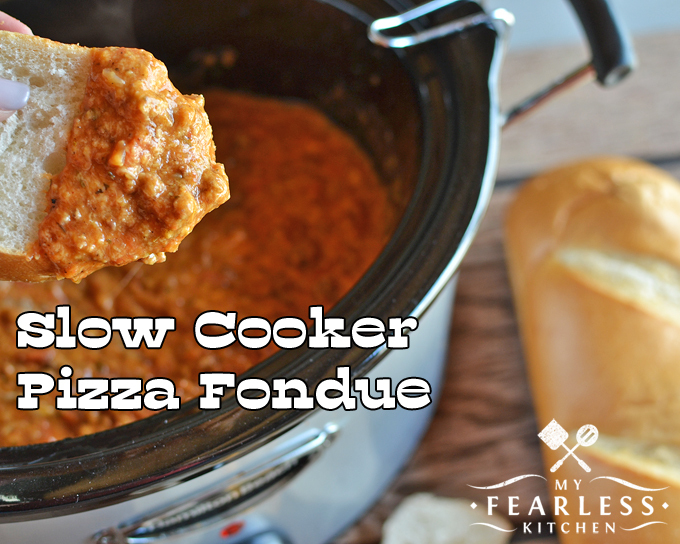 This Pizza Fondue will keep warm in your slow cooker as long as you need it to... but it won't last long! Packed with meat and cheese, it's pizza on a spoon! Brown beef and onion in butter in a large skillet over medium heat; drain. Add pepperoni. In a small bowl, mix together corn starch and seasonings; sprinkle over beef mixture. Stir in pasta sauce; cook until thickened. Add cheeses gradually; stir gently until completely melted. Transfer to a 6-quart slow cooker; keep warm on low setting. Serve with thick bread slices for dipping.